Primary challenge here is with deserializers i.e "suitable import code" Please help me with this. JSON to CSV conversion is secondary challenge here. @Shriyanshagro specifically what are you trying to deserialise that is missing? plone.restapi - RESTful hypermedia API for Plone. Seems to support both AT and DX out of the box. @datakurre, @pigeonflight and @tkimnguyenPrimary challenge here is with deserializers i.e "suitable import code" Please help me with this. Now with plone.importexport egg a user manipulated title using CSV spreadsheet to 'folderb', but still the Url, id and short_title remains same. In such case what about path and similar relations for subcontent of foldera or any other dependencies to foldera?? keep it simple: plone.importexport should not make any guess and should not fix anything. if the user breaks the CSV file, it will get a broken import. I meant that if you want an object's ID to match a changed title, you usually have to rename the object (ie. the title and ID are not strongly coupled). please keep things simple and don't start assuming too many things in this stage of the project: the first thing we need is to have an export/import process running; after that we can add some validation on row level. don't try to fix end user errors in the beginning. I was just curious about these type of contradictions and want community to come forward with ideas, which may be preserved for later implementations. Anyway for now I would just log every possible error in a file. I'm happy to share this, that the addon plone.importexport(build on top of plone.restapi) is advanced with its basic functionality of importexport Plone content in CSV data format(zipped in a file with blob content as file types). I invite everyone to test this product and share your valuable feedback. A few issues are already raised on the issue tracker, testers can add more to it if found any. Also moving on to the next phase, as the idea was basically to provide an ease to non-techie people with the content importexport, we need suggestions from the entire community for an easy to use UI. (mockups would be appreciated), upon which we could discuss and reach out to our goal. Please provide suggestions as simple as even a nerdy admin can understand and use it like a pro. What sort of UI designs do you have so far? The screen is accessible from the Actions menu on any folder. The screen would propose two tabs: Basic and Advanced. The Basic tab would allow to export all the folder and tree contents (and the result is immediately downloaded), or to import contents by uploading a file (about the data format see below). to choose the data format. After import a report is given of how many objects created, updated etc. Could it be an idea to make a (youtube) video? I was going to suggest displaying all the types of content that can be exported/Imported and maybe showing a checkbox for the ones that have been, or a side by side widget letting you select what to export/Import. A drag and drop widget to allow you to drop a file to be imported. I don't know if it's possible but being able to control the export from another site (or the import "to" another site) so that you can be controlling both the export and the import between two sites live would be fantastic. Then you could maybe also eliminate the handling of the files by tracking where you save them (e.g. in /tmp) so the files become invisible to the user. @tkimnguyen I didn't say it would replace folder contents. I mean inside the folder contents UI as an advanced feature. The alternative is it goes in toolbar > Actions, which I think would be more annoying. I think thats a great idea. If it can be done using some kind of token so there is no need to enter your password into one site as previous sollutions have done then that would be great. 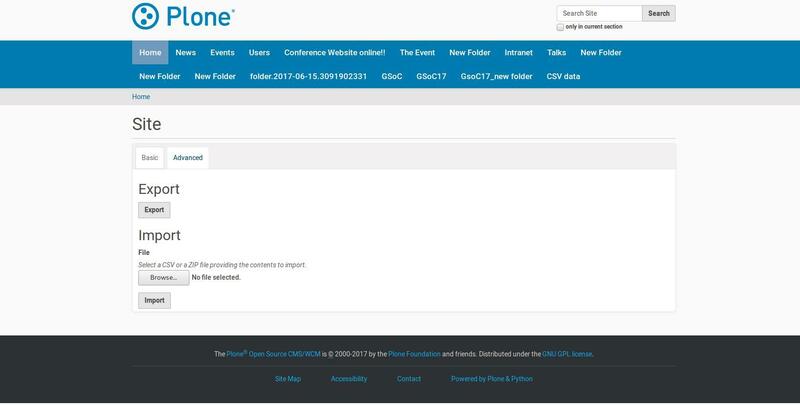 ie, click "connect" and enter url of other plone site. Gives you a popup where you login and that results in an exchange of a single use key just for exporting. Then you control the whole thing from the site you are importing to, select content, filters etc.